Safety Brock Vereen recorded 59 tackles, one forced fumble, an interception and six pass break-ups as a senior in Minnesota in 2013. 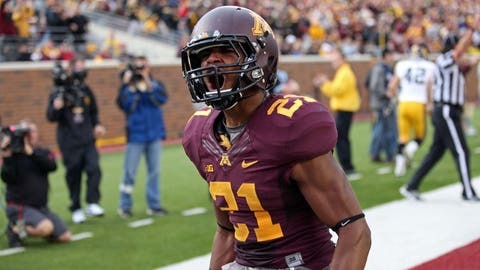 Former Minnesota Golden Gophers safety Brock Vereen will return to the Twin Cities after signing with the Minnesota Vikings’ practice squad. Vereen was selected by Chicago in the fourth round of the 2014 NFL Draft and played all 16 games as a rookie last season, with four starts, 39 tackles (30 solo), an interception and a forced fumble. Vereen was waived by the Bears on Tuesday after playing in the first three games of the season. Vereen was named first team All-Big Ten by the coaches and was an honorable mention by the media in his senior season. He started 36 of 47 games in his four-year career with the Gophers.